Sign posted on Clarion Alley. Wilson says that despite notifying numerous companies to cease offering tours of Clarion Alley, she’s observed new tours coming through the alley every day she’s there. These visitors are part of a growing trend affecting the entire city. According to the San Francisco Travel Foundation, the city welcomed 16.9 million tourists in 2013, a 13-year high. Most of the companies CAMP listed on its website confirmed that they had been asked by the arts group not to use the alley and several said they no longer operate tours down Clarion because of interactions with the arts-group. For some of the tour operators, the alley was clearly a heated subject. Another tour operator said an apparent representative from CAMP shouted at one of his tour bus drivers and then left a very negative review of his company on Yelp. 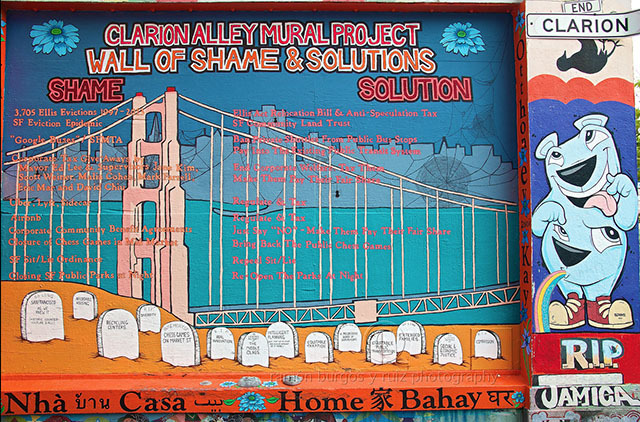 Michael Moran, a longtime Mission resident and owner of the tour company ExploreSF, explained that after having conversations with CAMP he now drops off his walking tours at one end of Clarion Alley, lets them walk down the alley on their own, and meets them on the other side. According to Wilson of CAMP, the restriction on tours other than their own has little to with business competition and everything to do with representation. Though CAMP is still in the process of building a website that will provide more details about its tour, Wilson says the tours will be offered on a sliding scale and may include a tour of the alley as well as a potential tour of the Roxie Theater, which has murals by CAMP artists. Other tours in the Mission, which include more than Clarion Alley and range in services provided, can be free or cost upwards of $70. Wilson says that in the many hours she’s spent painting in the alley, she’s heard numerous private tour groups sharing inaccuracies about Clarion, getting things wrong such as basic facts about who painted each mural as well as the project’s general philosophy. For Paula Tejeda, owner of Chile Lindo and a longtime neighborhood activist, CAMP’s requests seem counterproductive to the neighbor’s well-being, in that tourism is an industry that supports the Mission’s economy. It’s also personal for Tejeda. Her aunt Juanita Rieloff lived on the corner of Clarion Alley when it first became a public canvas and welcomed the artists into her home. Rieloff’s name is inscribed in one section of the alley as a commemoration of her support of the original artists. “When you are an artist, everyone is going to interpret your work differently; you can’t hold a patent on how your work is interpreted…it’s a street, it’s public,” Tejeda said. Wilson stressed that she has no problem with individuals coming through independently and says the alley is open to everyone and their own unique interpretation. “Self-guided tours are better…you can come and interpret the work however you want. But if you have a guided tour, they’re doing that work for you and speaking for the project and by some degree it implies it’s okay, when in fact it’s not the case” Wilson said. Started in 1992, inspired in part by the murals on Balmy Alley, CAMP hoped to create a subversive arts space that was more open-ended than Balmy’s focus on Latin American politics. The alley’s artworks represent a range of political issues and styles and it has long been a place for anti-capitalist and subversive manifestos. eceive consent from the artist. When Absolut Vodka used footage of Clarion Alley in an advertisement in 2011, CAMP campaigned against the beverage company. This past fall Mission Local was the target of CAMP’s frustration when the opening of the alley was featured on the winning entry, a Google Street View, in our Bedazzle a Tech Bus contest. On behalf of Precita Eyes, Patricia Rose says she completely understands CAMP’s territorial stance. While Precita Eyes used to operate tours along the alley, Rose says the organization stopped once CAMP started their own tours. Rose added that she, too, hears a lot of frustrating inaccuracies about Balmy Alley and has offered free Precita Eye tours to several erring tour guides. J. Jo, the founder of the new free tour provider called Wild SF Tours, also used to lead tours down Clarion Alley but has stopped out of respect for CAMP’s wishes. He acknowledges the complexity of leading tours in a neighborhood in the midst of so many often-fraught changes. For Wilson, one of those issues is the displacement of artists and their work. As such, she suggests that anyone interested in learning more about Clarion Alley get it touch with CAMP directly. If CAMP’s real goal is making sure the art is interpreted in their way, why don’t they put pamphlets at each end of the alley with an explanation of each mural? OR at least the name of the artist for each mural. Then everyone can get along. Enclosing on the commons is always a bad idea. i live 2 blocks from Clarion and have for over a decade. I understand where CAMP is coming from – if I put a lot of work into something I would want accurate information about it given out. however, they should do a better job of ensuring the passers-through can access that information. Perhaps a history of the alley and CAMP’s role painted in a corner at the entrance? maybe getting that website up and running so they can promote their tours? i agree that they are coming off as “control freaks” – understandably so to a degree, but they can do better at ensuring the right information gets passed on, instead of being heavy-handed. You don’t own a public street. Why don’t they just work together and get their artist story right? Then everyone will be happy at the end. It is because those artist want to get a piece of the pie as well; as in the tourist guide profit. Perhaps the tourist group should give a donation to the artist, then I’m sure it will be okay then. Since when does CAMP own a public street? Artists have the right to assert their voice in how their work is presented. Period. CAMP is not trying to “own” anything but their own voice. Part of the reason that tourism is so booming right now is because corporate air b&b is currently operating ILLEGAL HOTELS. Check the mural “shame & solutions” in the alley. And check your entitlement to others’ work. You are making privatization claims on a public thoroughfare and are asserting that others have entitlement issues? Once you put your art out there, you no longer control it. THAT IS WHAT MAKES IT ART. Thanks Daniel Hirsch and MissionLocal for covering this ongoing point of contention for Clarion Alley Mural Project … as we continue to try and convey to tour groups and others that the issue is one of respect, and as noted in the article – CAMP wants to represent our project and the 22 years of labor we’ve put into it. The concept of respect seems really simple to us, however, it’s clearly foreign to many others. Our response to those who believe our wishes aren’t worthy of that respect is – start your own mural project! If you feel so negatively towards how we choose to run our project and our desire to represent ourselves, then start your own project and run it the way you want to run it. CAMP does provide tours when requested and we are in the process of developing a new Website to better formalize our tours. We can’t stop others from giving tours – we’ve asked that they respect our wishes not to. Respect does not mean doing whatever CAMP says. CAMP needs to respect the fact that they’ve chosen to put their PUBLIC ART on a PUBLIC STREET. Run your project as you would, but after the paint dries, public streets are the commons, for the public. If CAMP wants total control, then find a private space to instal your art. Oh, yeah, the public would be able to see your art if it was installed in a private location. So the desire of the artist to receive the gaze gets trumped by assertions of control on who gazes, when they gaze, how they gaze and the motives of the gazing. How about you respect my wish not to paint graffiti on public space? Exactly. I can’t force you to acquiesce to my wishes on public space and neither can you force others. We can’t stop others from playing on the playground at Dolores park, but we ask that they respect our wishes that they not play there. It’s our playground since we’ve been there for 22 years and anyone else playing there doesn’t have any RESPECT! Seeing many comments here around the concept of “you don’t own a public street.” The artists do in fact own their public art. And the tours do in fact capitalize on the artists’s murals. On top of that, I have seen commercial photo shoots many times in Clarion Alley, where corporations want the “cool, edgy” look. And guess what, they are capitalizing on artist-owned murals without any compensation. In SF, the exterior walls of buildings are privately owned. If there is a graffiti tag on a building, you can bet a local hater will post a “paint over or get fined” notice so that the property owner has to deal with the problem (in that part of the Mission, there are a few haters who constantly post these notices). Property owners even own the sidewalks in front of their buildings, as well as the trees. So…. the streets are public and the rest is not. Finally, I have given art tours in the Mission for the past 2 years. I am also a muralist, author, and document street art. 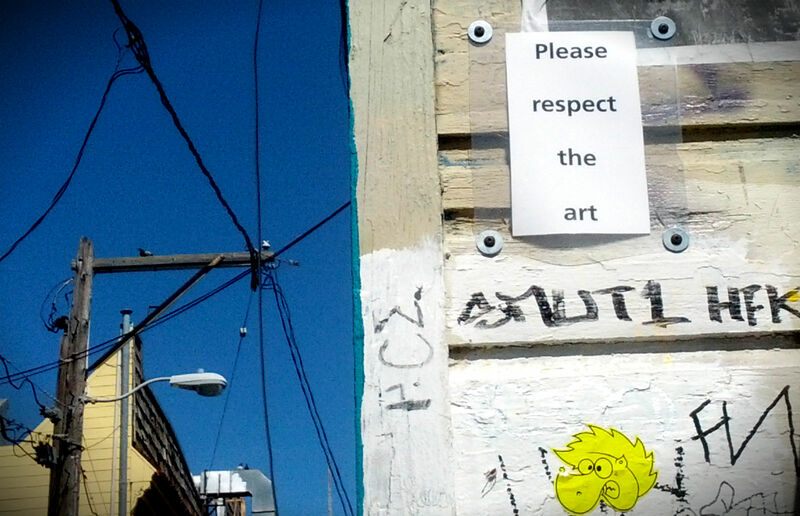 In the public art world (street art, graffiti, murals, etc) there is a word you learn very early that must be kept: RESPECT. When CAMP asked me to back off the alley, I had to see their 22 year history, their activism, their talents, and RESPECT their request. When it comes down to choosing between tourists, making money, and respecting the artists’s wishes, I’ll go with the local creative folks any day. That’s how things work in the streets. With the murals I have painted, and the walls I have helped get painted, I can only hope that the other artists will do the same for me. Well said Russell – thank you!!! Are you seriously trying to assert private intellectual property rights over representations of public façades of buildings? You can enforce copyright protection on “reproductions” of your art but trying to stifle “freedom of speech” about publicly display ed artwork is a non-starter. Why do you characterize those who object to graffiti tags as “haters”? Does this point support your argument? Point of information: property owners in SF don’t “own” the adjacent sidewalk or the trees; they are legally responsible for the sidewalk and tree maintenance, however. In a Charter City in California, the property lines run to the street center line but the public has right of way to the sidewalk and street. I have no reason to doubt that but, as a practical matter, the city tries to make property owners pay for repairs to the sidewalk outside their property but not the roadway itself. The most obvious reason why the mural artists do not “own” their art is that someone can come along and paint over it. They are temporary. If anything, the art is owned by the person who owns the property wall on which the painting resides. While it may be viewed by the public without charge, let or hindrance. I would like to say that considering that CAMP dedicated the alley to my aunt Juanita Rieloff, I wish they would put a little bit of work to their dedication, for it looks very run down. My aunt was very supportive of CAMP, as she was supportive of anyone creating their own path. I know, for a fact, that Michael Moran, founder of ExploreSF, is a very creative and progressive individual. He is the owner of a small business that supports other small businesses in the community. My aunt would have been supportive of his endeavor as well. These are sensitive times in the Mission, no doubt. I know only too well for I’m loosing my home of 17 years. However, that does not give me the right to decide who is or who isn’t welcomed in this community. The speculators creating this havoc are no where near Clarion Alley. Just “Let It Be”. This is about territorialism and self promotion plain and simple. In street art, like a dog peeing on a tree, competing for territory, is a long standing tradition in everything from simple tagging to more complex forms of graffiti. It stems from the same chest thumping territorial competition of gang banging and early rap/hip hop, but, in essence, it is much the same as commercial interests competing for limited market share or tribes competing for arable land. As a painter who has been mounting street art anonymously in the Bay since the late 80’s, I know that any public work survives at the discretion of the community. I find it amazing that so many supposedly “socially conscious” street artists would rather focus on promoting themselves while bemoaning the encroachment of commercial interests that gravitate to their beauty, rather than promote the simple truth that public art is a gift to the community, a gift meant to stimulate, question and inspire. If it is valued it will be celebrated, and that is wonderful. A gift, once given, is no longer “owned” by the giver. If the work needs to be explained, or the artist is striving for more recognition, then that should drive the artist to do a better job, plain and simple. If the artists feel they deserve more commercial benefit then they have a responsibility to bring the work to a commercial arena or to create innovative ways to market their public work. But to begrudge other parties for engaging freely in public space that you have adorned smacks of a certain kind of self serving shortsightedness that dramatically reduces the beauty and merit of such public gestures. Embrace the world and it will embrace you. Within that embrace you can change it, albeit slowly. Rail against it and you will be marginalized, sometimes slowly, sometimes not. Sounds like romantic philosophy but it is the code of Respect. The code of the street, any street. I am surprised that no one has mentioned just what it is that CAMP does to Tour Groups that disobey the laws of CAMP. CAMP attacks on Yelp. Douchey is as douchey does and if there is a douchier forum in which to attack someone who cannot fight back, I am not aware of it. So although CAMP says that they cannot make tour operators stop touring the public street whose adjoining buildings CAMP covers with copyright protected free public art. 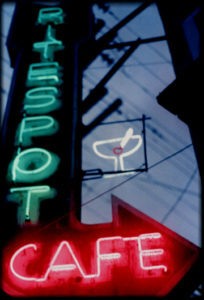 They know that businesses catering to out of town visitors rely heavily on small-business-fleecing Yelp. Less than 4 stars on this horrible site and you might as well not exist. Several months ago, CAMP tried launching their own tours of (one block long) Clarion Alley and fell flat on their faces. Back then they made no bones about why they wanted other tour operators out of the alley, so that their own tours would make money. They were completely unconcerned that this attitude is completely at odds with their core values, and they were willing to publicly destroy on Yelp, anyone who might get in their way. I read what CAMP wrote on their Facebook page about the Google Bus art contest, and I could not agree more. The idea that artists should compete to decorate a Google Bus, the very buses that transport workers into their neighborhoods and have caused the rents to skyrocket and led to thousands of people being displaced, many of them artists, is disgusting, repulsive and insulting. The winning artist was paid some minimal amount of money for an original piece of art as their reward, not even enough money to pay a weeks worth of rent. The whole thing was so vile, I thought it was a joke at first, something straight out of the Onion.